Losing a tooth is an unfortunate part of life. Whether it happens due to an accident or due to aging, you’re left with a missing tooth. If you’re like millions of other people with missing teeth, you’re likely wondering: what are my options for replacing a missing tooth? Here are the most popular and effective options for replacing a missing tooth. While this is not an exhaustive list of every option out there, it will give you an overview of your best options. Dental bridges come in two varieties: fixed and removable. Fixed bridges are permanently anchored in place and are connected to the natural teeth that surround the missing tooth. The benefit of this type of bridge is that it’s more sturdy than removable bridges. Fixed bridges are typically made of porcelain or a composite material. Removable bridges are ideal in situations in which other replacement options are not feasible. They are similar to fixed bridges, except that they are connected to nearby teeth with metal clasps and are not set in place permanently. Removable bridges are the most economical way to replace a missing tooth. Bridges look, feel and even function like natural teeth. Fixed bridges do not require any special cleaning, simply brush your tooth. Removable bridges do require special care. If most of your teeth are missing, dentures are almost certainly the best way to go. Dentures are a complete set of artificial teeth that are removed and cleaned every night. They are created to closely resemble a natural set of teeth. Dentures come in two varieties: partial and full. Partial dentures are similar to bridges in that they’re designed to replace a series of missing teeth. Meanwhile, full, or complete, dentures are designed to replace all of your teeth. Removable dentures are a great option for those on a tight budget, as they are more affordable than fixed bridges or dental implants. They are also easy to repair should they become damaged. If you’re missing one or two teeth, dental implants are a great option to explore. They can also be used to help anchor dentures or bridges. A dental implant is an artificial tooth that contains a root that is implanted into the jawbone. 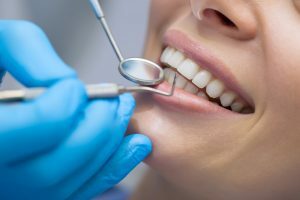 Due to the nature of being connected to the jaw, dental implants are known for being incredibly stable, durable and even looks like a natural tooth. Dental implants are the most involved option for replacing a missing tooth. 1. The dentist places the implant surgically into the jaw. After the surgery, there may be some swelling and pain. Your dentist will likely provide you with a list of approved foods. 2. Before the procedure can be completed, the post that was implanted must be healed. The bone will grow around the post and hold it in place. It may take several months for the post to heal before receiving the crown. 3. Once the healing process has completed, the dentist will fit the implanted post with a crown. Every option out there has different benefits and drawbacks. You’ll need to work with your dentist to determine which option is ideal for replacing your missing tooth. The best option will depend on your oral health, your budget, and your desires. Visit Accent Dental today to discuss the different tooth replacement methods.